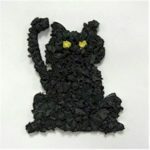 These Cat and Dog Paper Crafts are made with a few simple materials that most people have around the house. The kids will have fun making them and creating whole litters of friendly pets. Trivia: Cats conserve energy by sleeping for an average of 13 to 14 hours a day. Dogs only sweat from the bottoms of their feet, the only way they can discharge heat is by panting. Use your ruler to measure a strip 2" x 6 inches out of your card stock or construction paper and cut out carefully. We used card stock because it holds up better. Next, approximately 1 inch from the end cut through the paper from bottom to midway on the strip. Then take the other end of the strip and cut through the paper from top to midway on the strip. Locate the middle of the strip and draw in the features for your cat or dog and glue on the wiggle eyes. If you don't have a pink marker, use a scrap of colored paper for the cat's nose. If you opt not to use toothpicks for the cat's whiskers, draw them in with your marker. Don't be afraid to improvise on crafts. Insert the cut ends into each other with the excess paper rolled into the inside. 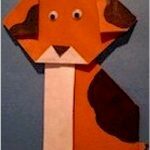 Fold a scrap of your card stock or construction paper in half and draw the dog or cat's ears. Cut two at once so they are the same size and shape. We decorated our dogs ears with the black marker and our cats's ears with the pink and black marker. 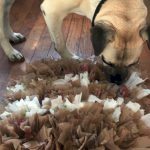 Glue the dog's ears on the outside and the cat's ears on the inside of the roll. Cut a length of black pipe cleaner and make a little knot. Then insert the unknotted end into the inside back of the cat and pull through until the knot is against the paper. Tape to hold the pipe cleaner upright. Put a little curl in your pipe cleaner for the cat's tail. Have fun creating your own unique cats and dogs.